As the inevitable (and certainly understandable) cries of “that’s what Q-School was for” tumble in, the PGA Tour’s exploratory look into a system that feeds college players to their various tours is being met with expected criticism. As someone who loved Q-School (and wrote many blog posts in favor of saving it), the criticisms are legitimate from the geezers who remember the old system (Brentley Romine reports for GolfChannel.com). That said, the ship on a proper calendar year schedule has sailed until fall sponsors realize they are badly overpaying for very small audiences. In the meantime, college players, who make up the majority of polished, long-term PGA Tour players that fans get to know and watch grow old because they arrive on tour a complete player, are turning pro earlier than ever. Check out Romine’s latest exclusive for GolfChannel.com on Alabama losing senior Davis Riley a semester short of getting a degree and finishing off a storied career for the Crimson Tide. Of all the players I saw at the U.S. Amateur, Riley was the most polished and complete. 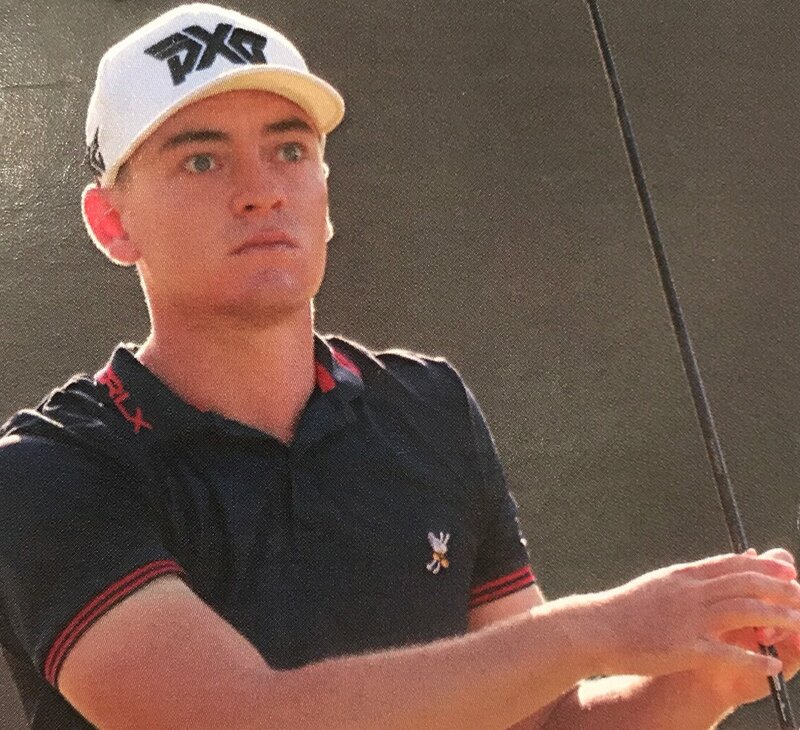 Maybe he didn’t have the extreme upside of eventual winner Viktor Hovland or runner-up Devon Bling, but his prospects are certainly strong. And yet, the only reason he’s turning pro can only be chalked up to the current schedule and system that has agents convincing him sponsor’s invites await, setting up Davis to maybe make enough money in 7 starts to earn a card. This is a longshot players are repeatedly convinced to take by agents and families, with very few succeeding. Which is why any system that encourages players to finish out their careers makes more sense than what we have now. Could The PGA Tour Be Onto Something Brilliant With College-To-Tour Concept? Nice work here by Golfweek’s Brentley Romine to reveal some details of a PGA Tour plan to get in the business of connecting college golf with the various tours. The plan is clearly in the early stages. And the PGA Tour’s acknowledgement quote (below) suggests they are looking for feedback on an ambitious plan to reward season-long college play with spots on various PGA Tours. We don’t know which tours or how many spots. But given the damage the wraparound season has done to men’s golf, along with the recent oddity of top college women playing LPGA Q-School mid-season, it’s refreshing to see a pro tour taking a proactive approach to the silly rush to turn pro. Anything designed to encourage players to stay in school and develop their games and character should be celebrated. We’ve already seen too many young players fail because of immaturity, with more on the way in a sport that may be getting younger, but not that young! The potential program, as outlined by Romine, could slow down the rush to turn pro for some and make aspiring players in college stick around longer. In other words, the best college golfers would be guaranteed status on one of several tours, ranging from PGA Tour China to the PGA Tour. It certainly would be and if successful, the program could even impact the disastrous current system in the NBA. We discussed today on Morning Drive. I’m not sure I’ve read a more horrific, dismaying or heartbreaking story than the murder of recent Iowa State golfing great Celia Barquin Arozamena of Spain. Thanks to all who sent the initial news reports. Two pieces worth your time in trying to appreciate her life taken by a sick vagrant as she simply practiced at Coldwater Golf Links. Dylan Dethier for Golf.com pieces together the events and the many lives she touched around the world as an elite golfer and Iowa State’s female athlete of the year who was soon to be honored at halftime of a game. Beth Ann Nichols for Golfweek tries to capture Arozamena’s personality and spirit, as well as a needless loss that will devastate so many lives. Also the Des Moines Register has set up this page devoted to all coverage of her death. The forces are strong, contrasting and fascinating: no American has won a major in 2018 and barring a miracle, the fifth and final LPGA major teeing off this week will produce just the fourth year ever when at least one American prevailed in a major. Matt Adams and I debated on this week’s Golf Central and with all due respect to the many fine players, the struggles of American women is the top storyline for me. My expression in the screen capture summarizes the fixed nature of the topic, but I digress. Clearly, next spring’s Augusta National Women’s Amateur will add another bit of incentive for aspiring American women, and we are about to start seeing if the Drive, Chip and Putt produces elite talent, but there appears to be some disagreement about the role college golf has (or has not) played in developing talent. With six scholarships available at fully-funded Division I programs, the reports of unused scholarships have raised eyebrows about what we are doing to develop junior girls. Jack Nicklaus brought this up in his Morning Drive appearance this week hosted by Gary Williams and in conjunction with Gary Player and Lee Trevino. But as Beth Ann Nichols notes in this Golfweek story, the misconception is not a great one given how many programs are not fully or even partially funded. Brandi Jackson hears it too. For nearly 10 years the former LPGA pro has guided players and their families through the recruiting process. But hey, on that bright note, the scenarios for a new No. 1 and other highlights going into the fifth (gulp) and final LPGA major played for the last time in September. Golfweek's Lance Ringler says the storylines are flowing in Wednesday's finale between Oklahoma State and Alabama. With OSU on their home course--the charm-free Karsten Creek--and huge crowds expected, Alabama faces hometown opposition in numbers possibly never seen since the format change. The Cowboys have won all year collecting nine victories in 12 starts and now they may be playing in front of the biggest home crowd college golf has ever seen. They are talented and that talent has produced wins, which has created confidence. All five players are ranked in the top 72 in the Golfweek/Sagarin rankings and all five players have a scoring average below 72. This will be fun to see the two styles go head-to-head in an atmosphere that may be unmatched to anything we have seen and may ever see again in college golf. Kevin Casey with the nuts and bolts of how the two teams survived some tight match-ups to advance to Wednesday's final. Ryan Lavner focuses on Alabama's late season rise thanks to talented freshmen, including Wilson Furr. And to think, Furr couldn’t even crack the Alabama lineup in the fall, his game in disarray because of what was later described as the driver yips. Karsten Creek might be the last place on Earth that a player with long-game troubles would want to compete – “There’s a lot of crosses out there – it’s killed a lot of good players,” Seawell said – but Furr got his game back on track this spring with the help of swing coach Jeff Smith. In the semifinals, Furr routed his opponent, 7 and 6. “They’re special kids,” Hodges said. The final match-ups and times. Golf Channel's coverage features the Golf Central Pre Game from 2-4 p.m., the Championship Match from 4-8 p.m. and Golf Central from 8-9 p.m. ET. Earlier in the day, Texas's loss to Duke meant the end of Doug Ghim's career. The Masters low amateur and 2017 U.S. Amateur runner-up was joined by coach John Fields to talk with Chantel McCabe and the emotions were real as you'd expect from one of the closer player-coach bonds in the game. Haley's Putt: "It was a real-life fairy-tale finish for the ages." Like any golfer, you won't be surprised to learn that Haley Moore has been subjected to her share of self-doubt. But at 6'2" and an early enrollee to Arizona, Moore has dealt with her share of bullying and obstacles to overcome. As Beth Ann Baldry writes in an excellent Golfweek story the day after a Cinderella story finish, there is more to learn about Moore, the latest U of A golf great who has LPGA aspirations. The first time Arizona associate head coach Derek Radley saw Haley hit a golf shot was off the cart path at Reunion Resort. The high school freshman hit a low-draw 6-iron to the middle of the green. Radley was immediately hooked. Baldry detailed a nice moment after the emotional day between Moore and Alabama's Cheyenne Knight, who now sets her sights on the LPGA Tour, writes Golfweek's Brentley Romine. They covered the television spectrum of awful to amazing over the course of Wednesday's NCAA Women's Golf Championship: there was the moribund Karsten Creek, a Fazio design just oozing with ryegrass overseed and a level of drabness that exceeds even his established standards for expensive mediocrity. Worse, it was a course devoid of spectators--beyond family members and officials. The only real sound came from a plane flying above to capture great aerials. All day there were players playing each shot as if it were their last, consulting pace of play-expediting rangefinders, only to then go to their yardage books and coaching insights as we waited, waited and waited for a golf shot to be struck. Then they got to the greens where they looked into green books and we viewers waited more to see golf shots. It was enough to make anyone despise what has become of the college game. Yet all of the tediousness was rendered (somewhat) moot when Alabama's Lakareber Abe recovered from a 17th hole debacle to hit perfect shots at the 18th and force a sudden death playoff for the team title between her Crimson Tide and Hayley Moore of Arizona. Moore ultimately sank the winning putt for the Wildcats and besides delivering her the memory of a lifetime, gave us viewers the chance to experience a highlight improbable win by the 8th seeded-Wildcats. Good for Haley and her teammates: you were clutch and genuinely earned this title. As for the college coaches and NCAA that have been handed the gift that is national television exposure: shame on you. No one in their right mind tuning in could come away with a positive impression of college golf when they see shots taking two minutes to play and absurd coaching intrusions and slow play. Okay back to the athletes. Ryan Lavner on the improbable journey of Arizona, a lineup somewhat cobbled together after a major mid-season defection and another attempted departure. Moore's interview with Kay Cockerill after sinking the winning putt. Led by a "Big 3" of seemingly unbeatable talent Alabama heads into Wednesday's NCAA women's final the overwhelming favorite, notes Golfweek's Brentley Romine. 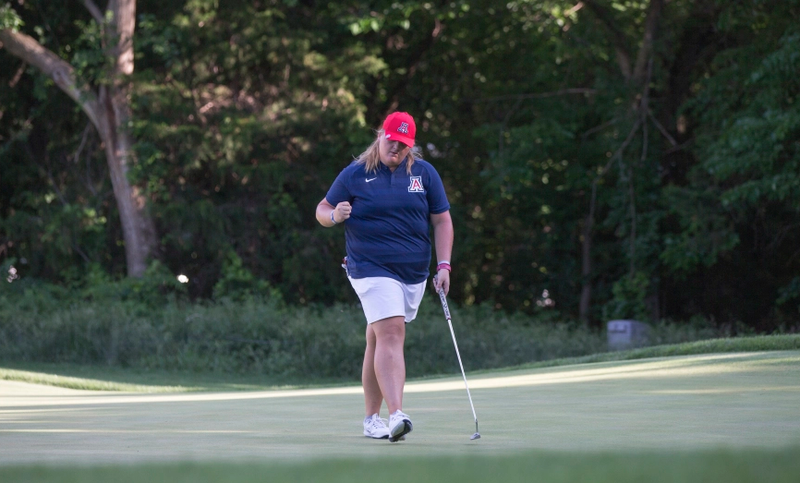 And while no one will ever call a Pac 12 school from Arizona an underdog in golf, the Arizona women hope to continue a string of upsets and all on very little sleep after escaping Monday night's bizarro playoff, writes Golfweek's Beth Ann Nichols. Highlights for Alabama fans from the semifinal win over USC. Highlights from Arizona's win over Stanford after having beaten UCLA earlier in the day. The final day matches courtesy of GolfChannel.com. Golf Central Pre Game 2-4 p.m. I'm not sure anyone tuning in early on to the final stroke play day of the NCAA Women's Golf could have come away feeling good about what they saw. --Players pushing around grocery cart-sized trolleys with corporate-emblazoned umbrellas. --Coaches interjecting mind-numbingly simple advice adding to the excruciating pace. --A lush, tree-choked, traditionally anti-septic Fazio design free of spectators that even friends and family passed on coming to see. --The debut of a new episode of Driven delayed two hours. But boy those OU and OSU boys know how to board a private jet and leave the bag loading to a luggage handler! America! Anyway, the entire affair in Stillwater felt like anything but a national championship, despite the fine effort by Golf Channel and the course maintenance team. And what a shame, as eventual individual winner Jennifer Kupcho is a phenomenal redemption story, pulling away to victory in front of her parents and excited teammates. As Ryan Lavner recounts for GolfChannel.com, Kupcho lost last year's individual title down the stretch and faced a water-lined hole this year to clinch the coveted individual title. This time, she was all clutch and the pride exuded by all made the long slog of a day all worth the payoff. On the team side, Arizona defeated Baylor in the dark to secure the 8th and final spot in match play starting Tuesday. This after Arizona junior Bianca Pagdanganan (T2 at 6-under par) eagled the 18th hole to force a playoff. The two-hole team playoff ended action two hours after Golf Channel was due to sign off. With the men's NCAA Division I regionals getting underway, there is, of course, only one place to go and that's the hub of all things college golf: Golfweek. The firm of Romine, Casey and Ringler will have the lowdown. Teams that have hosted a regional are 28 of 38 (73.6 percent) in advancing to the NCAA finals. Teams that are hosting a regional and seeded within the top 5 are 23 of 26 (88.5 percent) in advancing to the NCAA finals. Teams that are hosting a regional and seeded outside the top 5 are 5 of 11 (45.4 percent) in advancing to the NCAA finals. For scores, you MUST download the updated and modernized Golfstat app, available for both iPhone and Android. The desktop options are great too. Virus, Schmirus: How About Those Baylor Women! Golfweek's Beth Ann Nichols reports on the impressive fortitude of the Baylor women's golf team advancing to the NCAA Championships via the Austin regional. This, despite losing a player in final round play to a bizarre virus that swept the region, while another played sick. East Carolina was forced to forfeit and health officials have no answers as to what caused the mystery virus to spread at University of Texas Golf Club. "Behold The Arms Race In College Golf"
Global Golf Post's Steve Eubanks considers the possible ramifications of the Georgia's and Alabama's of the world and many other college golf programs locked in an arms race that now includes showing recruits private jet options. More amazingly, donors happy to pony up for things like Georgia's new $4.5 million practice center. A) Hitting a football (well) with a golf club is quite difficult without hurting yourself. B) Doing so in front of a full stadium with your collegiate peers is no easy bargain. C) Having the audacity to pull off a little Chi Chi sword-return-to-its-sheathing. "Desimone battles cancer and fights for Cal Golf"
Ryan Lavner of GolfChannel.com catches up with longtime Cal golf coach Steve Desimone who explains why he left coaching when he did, what's done to fight cancer, and his effort to endow the golf program. Given Cal's propensity to drop men's sports programs, the endowment is probably a great idea. Even better is hear Desimone has battled cancer successfully. When Desimone started at Cal, he had three goals: win a national title; create a facility for the team; and ensure Cal Golf in perpetuity through an endowment. He accomplished the first two objectives. He and the committee hoped to finish the last part before he retired, but the cancer diagnosis understandably derailed their progress. They’re roughly $2.5 million short of their $12 million endowment goal, at which point the interest would kick in enough to fully fund the program. That would take some of the fundraising pressure off Chun and the committee, but more importantly it would ensure that the program – that Desimone’s life’s work – remains untouched. It’s the final task of Desimone’s storied Cal career, and he has worn himself down trying to finish it. He wants closure. Alana Johnson reports for Golf.com on PXG announcing partnerships with six universities to provide 10 custom-fit sets to the men's and women's programs to divy up (*story incorrectly stated). Given that five people start for a college team, this will leave some players out of the free equipment (first) world, but that didn't stop PXG's Bob Parson's from turning what might be a negative into a positive (verbal). In a press release, PXG's founder Bob Parsons touted the company's commitment to delivering equal support to golfers within the University Program. "It is beyond me that the men's and women's golf teams are frequently afforded different levels of support. At PXG, we make golf clubs for golfers. Period," said Parsons. "The schools we choose to partner with will receive equal sponsorship for both the men's and women's teams." It's certainly admirable that Parsons is taking care of women's programs as equally as the men. But also fascinating to see a company suggesting the privilege of free gear has somehow been skewed by gender to this point. I certainly could see that at smaller programs, but from everything I've seen the larger women's programs are well taken care of. Anyone hear differently? I'm a little surprised there has not been more sports media world reaction to the NCAA locking in the golf championships with Golf Channel through 2029. Given the constant chatter about the demise of pay cable and possibilties of streaming, the NCAA chose not to go down that latter path (there had been rumblings!). Granted, this is not the NBA or NFL, but most rights deals are very closely watched and at least in the golf world, this was a potential content for CBS Sports Network or the PGA Tour's possible entry into the space. The length of the deal is also eye-opening given the supposed uncertainty of rights deals and the difficulty in trying to get the NCAA back on television (where it has since thrived). Given the expenditure by Golf Channel on the production side, I'd also note this deal is another huge victory for team match play as a format. Not that a boost was given, but since the NCAA switched to this format and memorable finishes have ensued, it's another hint that television has fully embraced a format beyond stroke play. While the greens appeared to confound even the last two teams standing, the 2017 NCAA Men's Division I final and its match play format proved compelling again. Oklahoma edged Oregon in a final that, not surprisingly, came down to the final match between last year's U.S. Amateur runner-up and the same player who carried Oregon to the 2016 title. Beth Ann Baldry at Golfweek with the Sooners story and the tragedy that befell coach Ryan Hybl and wife Rebecca earlier in the season. Brentley Romine with the key match details where Oregon put up a great fight. Ryan Lavner with Sooner anchor Brad Dalke's story. Recruited by OU since he was 12 and a commit by 7th grade, he fulfilled a dream come true and did it with a mix of clutch shotmaking and class in Wednesday's finale. Lance Ringler looks back on two weeks at Rich Harvest Farms and an NCAA season that saw powerhouses Arizona State and Oklahoma winning titles.